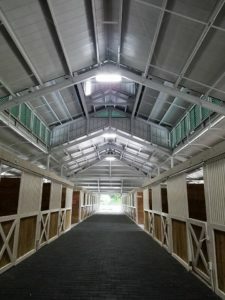 EquiLumination has the most complete and comprehensive line of fluorescent high bays on the market. Our lighting is a much superior alternative to metal halides, while operating at a fraction of the cost. We are specified by the industries top architects and consistently used by the best Equestrian Builders due to our consistent quality and service. Our fixtures are designed specifically for use in horse facilities and the environments surrounding horses. 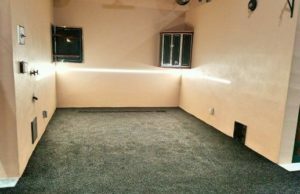 We light stalls, grooming/wash stalls, feed rooms, hay barns, maintenance and storage areas, aisle ways, breeding sheds, veterinary facilities, and indoor/covered riding arenas. With GE Ballasts, Miro Reflectors, and Metal Clips Standard – No other lighting source can compare. We combine the latest innovative technology with the highest grade components to produce the most effective, safest, equine friendly fixture available. 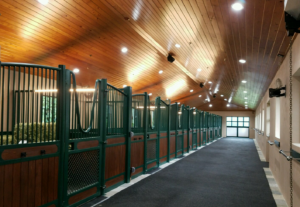 Our goal is to provide you with an affordable and effective lighting solution that creates a safe and enjoyable environment for you and your horses. EquiLumination is a lighting solutions provider, find out what we can do for you! 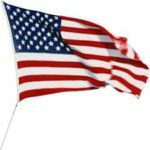 Search our selection of LED arena and barn lights, fluorescent lighting, and wet location fixtures to find the style that suits your facility needs. For wet areas of your barn including areas you intend to power-wash, our reliable vapor-proof fixtures have got you covered. Vapor-proof fixtures are perfect for lighting stalls, aisles, tack rooms, wash stalls, grooming stalls, breeding sheds and veterinary clinics. They are fully sealed and have a gasket to lock out moisture, dust and dirt to ensure safety and the lifespan of the light.